How to start your system in diagnostic startup mode? If you can not delete delete a file that is causing program to your system because the file in use, you can restart your system in diagnostic startup mode. In diagnostic startup mode, only basic devices and services are loaded. All other programs will not be running. This should allow you to delete any non-system files. 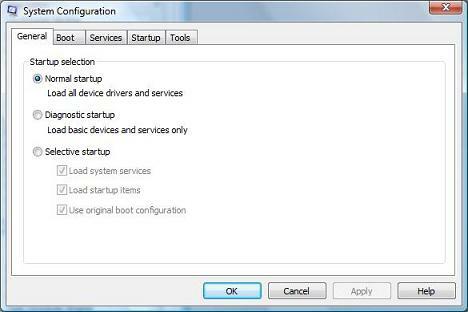 Here is how to restart your system in diagnostic startup mode on a Windows Vista system. Click Start > Run, enter "msconfig" and click OK. The System Configuration will be displayed. Select "Diagnostic startup" and click OK. Your system will be restarted in diagnostic startup mode.